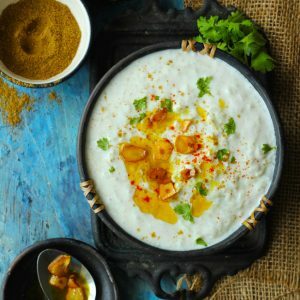 Baingan Ka Raita is a delicious, quick, 100% gluten-free raita recipe. 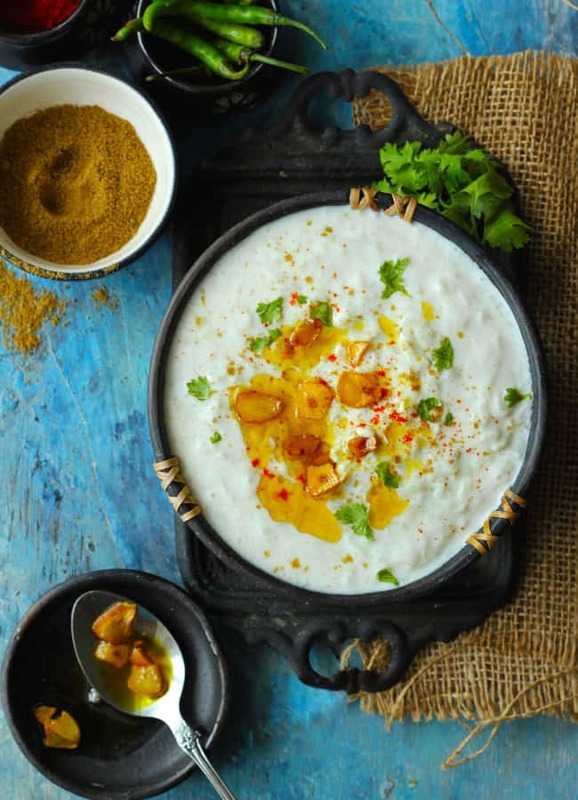 If you are bored of Baingan Bharta then you must try this Baingan Ka Raita Recipe. It has the earthiness of the roasted eggplant and the sweetness of yogurt – perfect to serve with biryani and pulao. This Baingan Ka Raita Recipe is one of my recent discoveries and I am totally loving it. With this recipe in hand, you can include eggplant in your everyday meal in such a delightful manner. Baingan Ka Raita has given me one more reason to love the humble eggplant. Raita is one side-dish than adds loads of charm to the whole meal. It is a perfect condiment to compliment the spicy and bold Indian curries and rice dishes. And raita is one of the coolest ways to consume tons of yogurt on a daily basis. 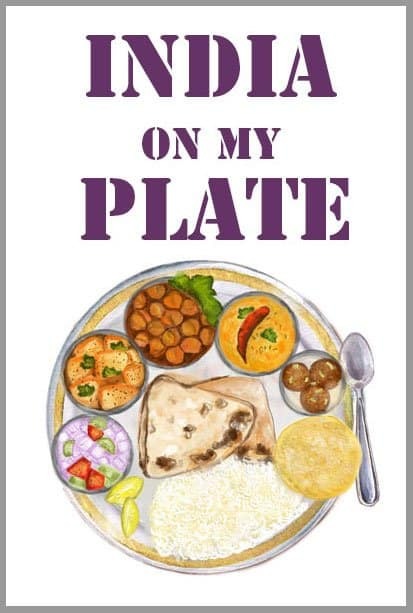 I personally make sure that a variety of raita dishes make an appearance on our everyday meal plate. Whether it is Mint and Pomegranate Raita, Pineapple Raita, Spring Onion Raita, or the latest addition Baingan Ka Raita, they all are my favorite. 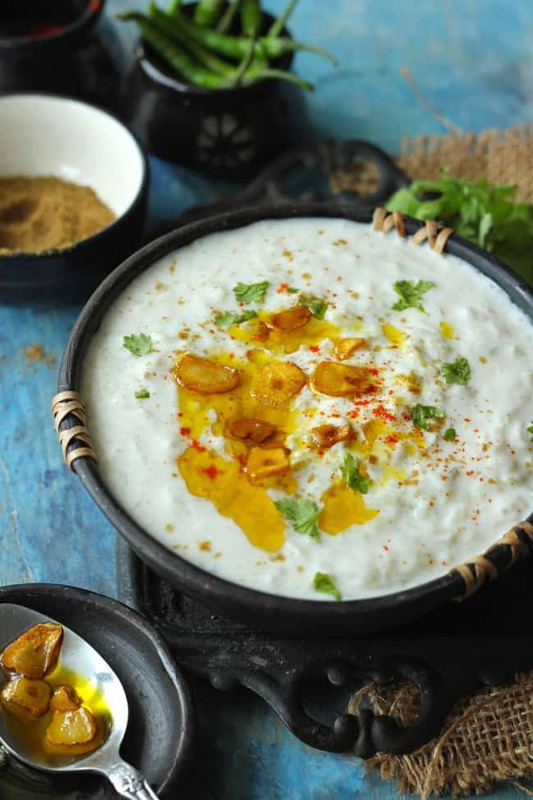 The good news is – this Baingan Ka Raita can be the uber cool dip with chips for the Friday night party. You can serve it as a dipping sauce with Fish Fry, Tandoori Prawns and so many other tasty appetizers. And can I just tell you how insanely delicious this dip is? It’s – creamy, savory, smokey, altogether satisfying and healthy too. What more could you ask for in a dip? Wash the eggplant. Pat dry with a kitchen towel. Prik the eggplant with a fork 2 – 3 times at the equal distance. Roast the eggplant over the direct flame of the gas stove until the skin gets nicely charred. Turn off the heat. Allow the roasted eggplant to cool completely, peel the charred skin and nicely mash the roasted eggplant. Whisk the yogurt along with the salt and spices. Use 1/4 Cup of water to get the desired consistency. Now combine mashed eggplant and whisked yogurt. Mix nicely. Taste and adjust the seasoning. Heat oil in a small pan till it starts fuming. Reduce the heat and add garlic. Fry the garlic till it turns light golden in color. Turn off the heat. Pour the tadka over the raita and stir to combine. Serve Baingan Ka Raita chilled.